Observation - Gall on Lime - UK and Ireland. 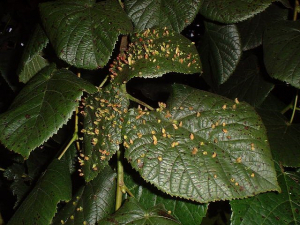 Description: Numerous small upward-projecting galls on many lime leaves, Tilia cordata. Identification of the gall-causing insect is requested. Numerous small upward-projecting galls on many lime leaves, Tilia cordata. Identification of the gall-causing insect is requested.